This in-world quote succinctly explains why this book still ranks as the favourite volume of my favourite grimdark epic fantasy series. It is the reason why I even read grimdark in the first place, given that I am so easily assailed by emotions that one wonders why I willingly put myself through such heartbreak. So bear with me throughout this series when I keep waxing lyrical about how humanity manifests its most amazing attributes in the face of relentless hardship and horrors of a world ravaged by conflict. As Deadhouse Gates dealt with the rise of the Seven Cities rebellion, the Memories of Ice was of the events that happened concurrently back on Genabackis as Dujek Onearm's Host together with Whiskeyjack and Captain Paran with his Bridgeburners turned towards the threat of the Pannion Domin, a rising empire sweeping up from the southern reaches of the continent. 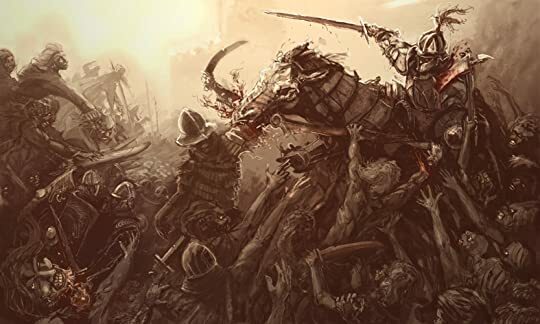 Where two previously opposing armies now turned allies - the renegade Malazans and the mercenary armies of Caladan Brood, who was backed by the ever mysterious Tiste Andii and their lord, Anomander Rake; a gathering of possibly the world's most powerful and dangerous. While there were more new characters being introduced yet again, we have familiar and favourite faces from Gardens of the Moon which made the connection to the story significantly smoother. The characters, both new and old, were absolutely compelling in the portrayal of humanity at its best. Within the Pannion Domin led by the Seer, was manifested in stark brutality, the ugly side of humanity when faced with an all-consuming need, one which was the most primal of all. The first big battle evinced the fragility of mortality but in direct contrast, we also see the sheer resiliency of mere mortals sworn to protect their own. And those who were singular in their courage driven by grief and loss from the mindless deaths that accompanied such savagery. Amidst this bloody campaign against the Pannion Seer, the storylines of a few notable characters were the most captivating. Firstly, that of unlikely new friendships forged between mortals and almost immortals. One of which was a bond forged through the burdens and unspoken grief that both had lived through, no matter the disparity of its length in which it was born; the other by a shared path and unexpected compassion. From such a chance contact, also rose an improbable but beautiful love story within the newly allied armies. The improbability was not so much because of the different camps from which the two lovers sprung from, but because the different life-span and nature of their respective people. A love between a human and a long-lived being who has lived through so many years of despair that her race was given to apathy for over a millennium. Well, I am just about done as to continue regaling about all the grim yet touching and inspiring storylines in this book will just be too much for a review. Suffice to say that even with the stupendous tale of the Chain of Dogs in Deadhouse Gates, Erikson successfully followed through with another superior installment to the Malazan Book of the Fallen. The ending sequence in Memories of Ice was epic, relentless, emotionally powerful and tragic. Even though this was a reread, I was not insensate to the heartbreaks that Erikson seemed to love subjecting his readers to.